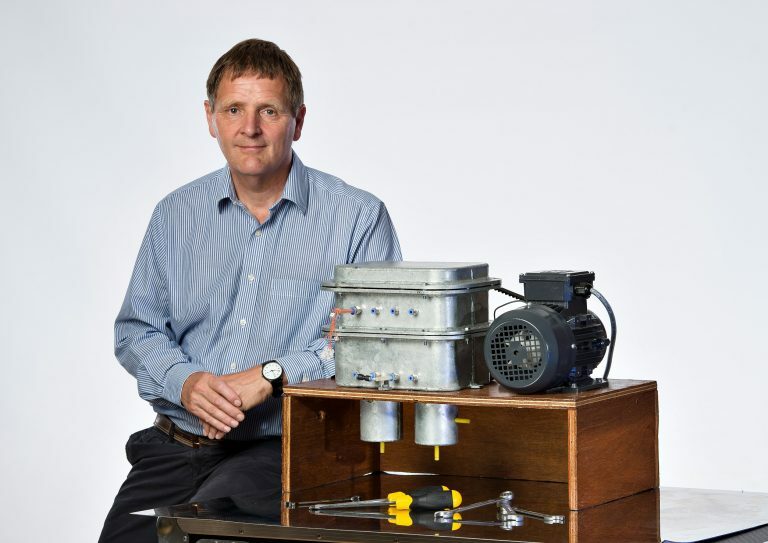 Fluid Mechanics with financial support from the Defence and Security Accelerator is developing a new type of heat pump or refrigeration system. This new technology does not use the vapour compressor or other commonly used methods of refrigeration. This technology is more energy efficient than existing methods of refrigeration, it will reduce the power requirements and operating costs for cooling. This new technology does not use vapour gases such as CFC, HCFC, HFC, CO2 or hydrocarbon gases. Instead the preferred gas is helium or hydrogen. Also the actual volume of gas used in this new cycle is at least two orders of magnitude less than the vapour gas used in a comparable sized vapour compressor heat pump. The Near Isothermal Stirling heat pump uses Fluid Mechanics patented near isothermal compression and expansion technology. The overwhelming majority of all current refrigeration systems use the vapour compressor cycle which was first commercially used in 1850. And for good reason, as the vapour compressor cycle is currently the most efficient and cheapest way of providing cooling. The Near Isothermal Stirling heat pump changes this working assumption. When measuring thermal efficiency of both heat pumps and engines it is usual to compare the efficiency to the hypothetical Carnot Cycle. The Carnot Cycle is hypothetical because no one has practically made a Carnot Cycle however based on the laws of thermodynamics it can be shown that this is theoretically the most efficient any machine can be. So it is usual to compare the efficiency of a machine to the theoretical maximum as defined by the Carnot Cycle. The COP (coefficient of performance) of refrigeration is the ratio of cooling heat flow to the input power. Typically for a vapour compressor refrigerator this can vary from 2 to 4 depending on the operating conditions. However, when compared to the Carnot Cycle the efficiency is at best only 40% and often as low as 20% of the theoretical maximum. The vapour compressor cycle is thermally relatively inefficient despite over 150 years of development. Fundamentally there are a number of thermodynamic reasons why the vapour compressor efficiency is limited and any future improvements in efficiency are likely to be marginal. The cycle is not reversible (it could not be used as an engine) and this irreversibility manifests its self as energy losses which limit its thermodynamic efficiency. Some of the major energy losses include, gas temperature leaving the compressor is higher than the condenser temperature; the vapour at the throttle valve has to be super cooled; expansion of gas in the throttle valve; vapour at compressor inlet has to be super heated. Fluid Mechanics are not claiming an ideal Stirling machine as there are many practical limitations which limit its efficiency. But they have developed a technology which can approximate the cycle so making a machine that is significantly more efficient. The Stirling cycle was invented by the Rev Robert Stirling in 1816 and it is well understood. Over the years many Stirling machines have been made but none come close to the ideal Stirling cycle in terms of efficiency and they all suffer from low power density. Fundamentally the problem has been the ideal cycle requires the gas in the cylinders to be compressed and expanded isothermally, but this is not possible using a standard piston and cylinder. Normally when a gas is compressed or expanded in a cylinder the process is almost 100% adiabatic, so current Stirling machines are not even close to the ideal Stirling cycle, and this significantly reduces efficiency. Getting the heat flow across the cylinder wall into the working gas is also another fundamental limitation of the power density of current Stirling machines. 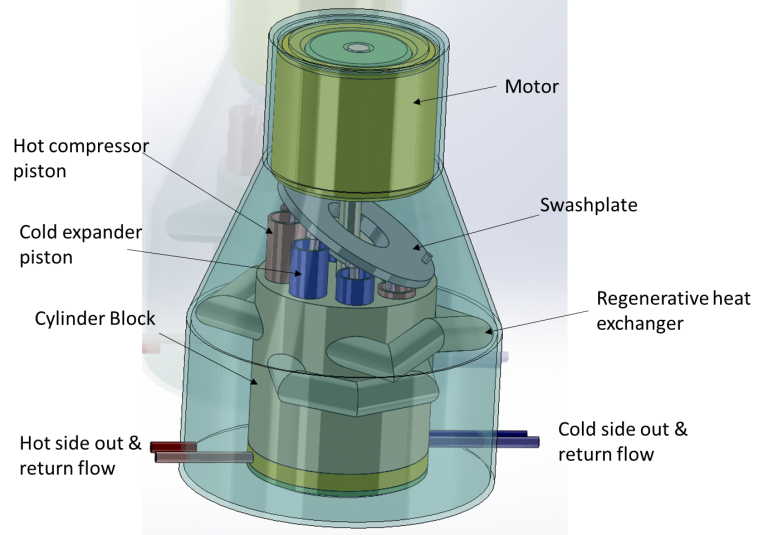 Our first prototype heat pump. By using Fluid Mechanics near isothermal technology inside a Stirling Heat pump it is possible to build a Stirling machine in which the gases are expanded and compressed at near isothermal conditions. And because the conditions inside the machine are near isothermal, the cycle efficiency can approach that of the ideal Stirling cycle. This is why the technology is call the “Near Isothermal Stirling Heat Pump”. The image above shows one of the key components in this new technology. 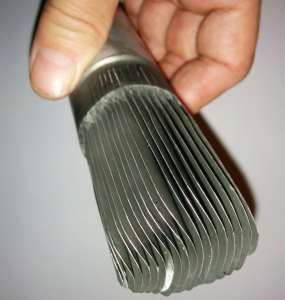 A series of parallel fins are mounted onto the end of a piston. The gas is compressed and expanded within these closely packed fins. It is these fins which ensure the process occurs at near isothermal conditions and so is highly efficient. In the bottom of each cylinder there is hydraulic fluid into which the fins are inserted and withdrawn on every cycle. This hydraulic fluid allows the rapid transfer of heat across the cylinder wall boundary so ensuring high power density. 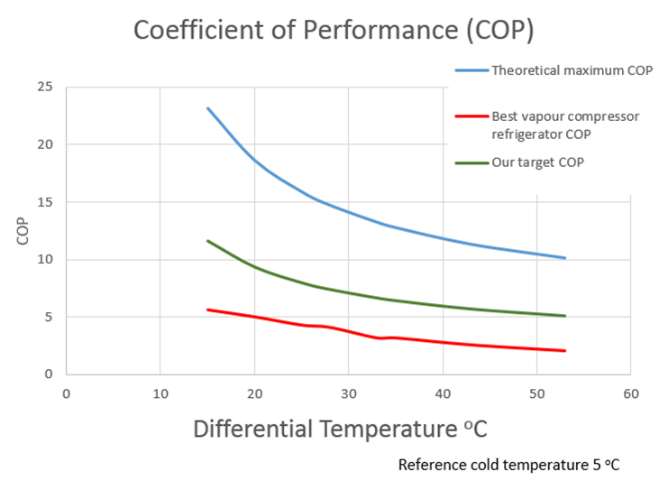 The blue line in the graph above shows the theoretical maximum COP based on the Carnot or ideal Stirling cycle for various temperature differences between the hot and cold sides. The red line shows where the best of the current refrigeration systems are today. The green line is Fluid Mechanics target for the next development stage. Already with the prototype shown above a COP of 6 has been achieved. It is expected the next machine will show significant efficiency gains compared to the first prototype. Refrigeration is widely used in the industrial, commercial, domestic and transportation sectors. Providing power for refrigeration in all its forms is one of the single biggest contributors to worldwide CO2 emissions. Fluid Mechanics technology is a disruptive technology which will make refrigeration significantly more energy efficient with a corresponding reduction in CO2 emissions. Most of the refrigerant gases currently used for refrigeration are being phased out due to government legislation and international agreements. As these refrigerant gases have in their own rights very high global warming potential. The gasses used in this new technology has no or negligible global warming potential.